It can be difficult, as a jaded adult, to appreciate a great fairy tale—one where the hero always wins and naivety is a character strength rather than something to grow out of. So it is with Ni no Kuni II. But if you can look past this game’s more childish tendencies, you’ll find a fairy tale worth experiencing. This piece originally appeared 3/19/18. We’ve bumped it today for Ni no Kuni II’s release. 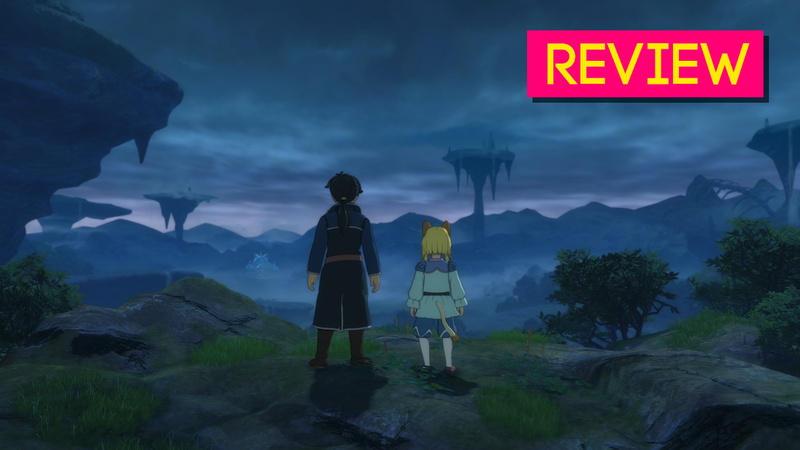 Like its wonderful predecessor, Ni no Kuni II is a big role-playing game set in a colorful world reminiscent of a Studio Ghibli film. (Ghibli worked on the first game, but not this one, although some former Ghibli staff including animator Yoshiyuki Momose were heavily involved.) There are a few other carryovers and references to the first game, but otherwise, Ni no Kuni II feels brand new. Level-5 has stripped away all of the more tedious elements and added a bunch of smart features. One small example: In Ni no Kuni, to cast the Quicken Growth spell on a plant, you’d have to navigate three or four nested menus. In Ni no Kuni II, you just have to go up to the plant and press X. Most importantly, the developers have transformed the combat system. No longer will you have to try to sort through menus or manage a party full of AIs who love blowing all of their magic at the worst possible moment. Battles in Ni no Kuni’s sequel are set in real-time, like a Tales game, and they stay snappy and fun throughout the whole game. Ni no Kuni II is far too easy (it desperately needs difficulty settings), the quests involve lots of mundane fetching, and the story is so sweet it borders on saccharine. Yet the game is also full of humor, delightful moments, and addictive systems. It looks beautiful, sounds fantastic (thanks to returning composer Joe Hisaishi), and performs great (never dropped below 140FPS at 1440p on my GTX 1080). Ni no Kuni II’s childlike wonder managed to charm at least this tired adult. "Fixes everything you didn't like about the first game"
Every good fairy tale needs a proper hero, and in Ni no Kuni II, that’s Evan Pettiwhisker Tildrum, a blonde boy-king who is ousted from his throne in a violent coup. After the painful loss of a dear friend, Evan decides to start a brand new kingdom, called Evermore. His goal with Evermore is not simply to rule over a group of likeminded civilians. No, once Evan gets his new kingdom off the ground, he decides to travel around the world, forging alliances with Ni no Kuni II’s other nations and asking them to essentially swear fealty to Evermore, signing a pact of world peace. That’s right: Evan, like Kefka and Luca Blight before him, wants to rule the world. If he wasn’t so damn sweet about it, he might make for a good JRPG villain. This particular child-king is too nice, though. He’s a goody-two-shoes with bad hair. Far more interesting is Roland, a president from a real-world country who winds up trapped in Ni no Kuni’s fantasy world and serves as advisor to the wannabe king. Roland’s motivations are a little inconsistent, but he brings a suave confidence and adult sensibility to the team. When Evan’s innocence gets cloying, at least Roland is there to keep things more grounded. It’s a simple, childish story with a very bad ending, though there are enough fun jokes and goofy premises to keep things entertaining. What really stands out is the setting. 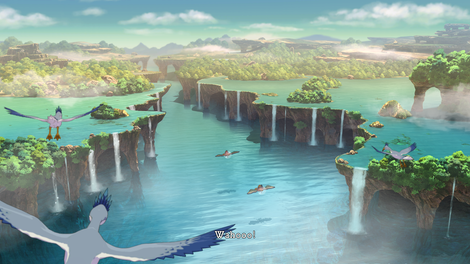 Ni no Kuni II takes place within a bright, beautiful world full of colorful monsters and lively towns. There’s a city whose rules and regulations are determined entirely by the roll of dice, a corporation so massive that it got its own country, and an ocean-side village whose inhabitants don’t wear pants. 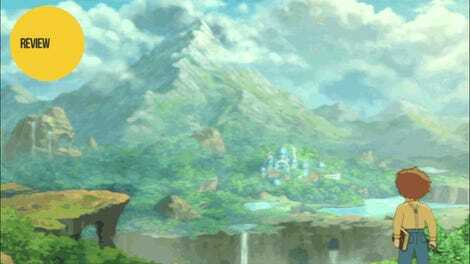 The world is also full of optional caves, forests, and dungeons, and Ni no Kuni II rewards you well for exploring them. It’s all peppered with goofy humor and charming little moments, enhanced by a great script from Richard Honeywood and the rest of his team at Level-5. They especially had fun with the items. You won’t just heal yourself with medicine; you’ll use Soreaway. You won’t just pick up fruits and vegetables; you’ll get Swirly Apples and Crybaby Onions. There are hundreds of these entertainingly titled items, and they help fuel the intricate machinery of Ni no Kuni II. Snag enough milk and you can use it to upgrade one of your Higgledies, the Pikmin-like spirits who assist your party during battle. Grab the right lumber and you can make your swords more powerful at your kingdom’s weapon shop. Maintain a big enough mushroom collection and you won’t have trouble solving the mushroom-centric quizzes of your friendly local teacher. The sheer number of objects can be overwhelming, but nothing feels like a waste. Every time you’re out in the field, you’ll stuff your pockets with items, and chances are high you’ll be able to use them all for something. Ni no Kuni II’s other fascinating component is the kingdom-building system, which allows you to improve and maintain your own sprawling city, sort of like a Suikoden game. As Evan and crew travel through the world, they’ll run into dozens of different people who are unsatisfied with their current lives and want to join Evermore. Usually you’ll have to do a side quest in order to get them to come along. A guard may want you to defeat some invading bandits, or an aspiring bodybuilder may want you to fetch him some lean protein. Once you’ve solved someone’s problem, they’ll mosey over to Evermore, where you can chat them up for free goodies and put them to work however you’d like. Each of these new recruits has a specialty. Some might work best at the spell-researching facility, while others are good at gathering materials in the farm or mining camp. It’s not hard to decide where to place each of these civilians, but it is hard to decide how you want to focus your kingdom. To govern Evermore, you’ll need to rely on a unique currency called kingsguilder, which you can use to construct new buildings, conduct research, and upgrade your kingdom. Kingsguilder is very limited, and it’s unlikely you’ll be able to max out every possible area of your kingdom, so you’ll have to specialize. Do you want to focus on getting the best armor? Learning the best spells? Maxing out your abilities as you explore the game’s tricky dimensional mazes, self-contained optional dungeons with their own rules and challenges? What’s most fun about those dimensional mazes, like every other dungeon in Ni no Kuni II, is that they give you the opportunity to run around and whack things. The combat system, a highlight of the game, is punchy and satisfying. It’s basically the opposite of the first Ni no Kuni. Different buttons correspond to strong, weak, ranged, and special attacks, and using them all to tear into enemies never stops feeling good. You’ll fight bad guys right on the battlefield (except when you’re on the world map), which does away with the friction you’ll find in trash battles during most RPGs. Fighting monsters doesn’t feel like an obstacle; it feels like a fun, natural part of exploration. The bulk of these encounters are way too easy—again, Ni no Kuni II desperately needs a difficulty slider—but they’re entertaining nonetheless. The skirmish system, on the other hand, is nothing but friction. Certain encounters in the game will take place via skirmish—meaning, your kingdom’s army will have to battle other people’s armies—and Evan will have to march through a battlefield, leading groups of soldiers who stand near him. You have to smush these groups of soldiers into enemies, vaguely paying attention to the types of attacks each group uses, and it all feels messy and imprecise. There aren’t too many of these battles, fortunately. When you do have to deal with them, they feel half-baked. Ni no Kuni II is a very good role-playing game, one full of satisfying mechanics and fun battles. It’s also got quotes like that. Even for a fairy tale, this game is naive to the point of parody. Every challenge in the game can be overcome with sheer willpower. Every villain can be convinced to see the light. Everybody wants to serve Evan the boy-king, and all of his decisions are good and pure. But the game is just so charming, so fun, and so delightful to play, that it’s easy to get over that. It’s easy to get sucked in.